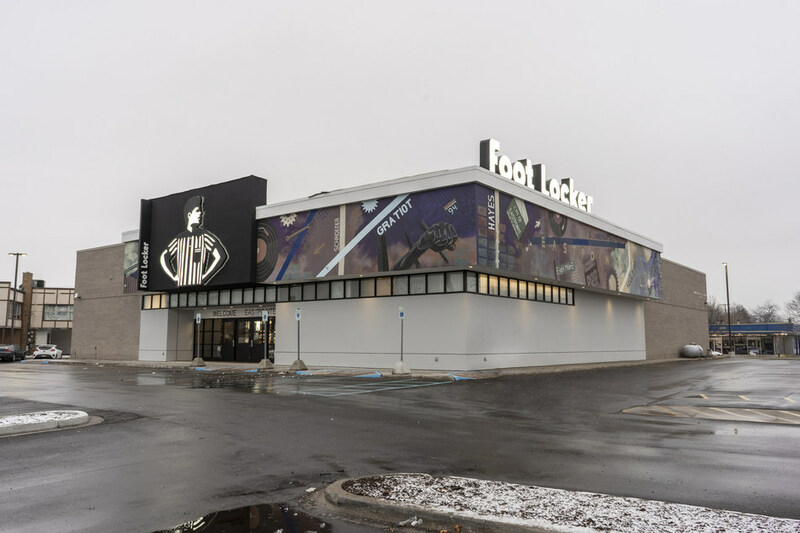 Foot Locker Inc. unveiled its newest store model with the opening of a “Power Store” on Friday, Jan. 25, on 8 Mile Road in Eastpointe, MI. With more than 8,500 square-feet of retail space, Foot Locker boasts full-family shopping with a women’s shop-in-shop and a Kids Foot Locker; offering footwear, apparel and accessories for men, women and kids. Foot Locker, Inc. currently operates Power Stores in London, Liverpool and Hong Kong and is expected to open more than a dozen new Power Store locations across its family of brands in 2019. Upcoming stores are planned for communities in Los Angeles, New York and Philadelphia in the U.S., and Milan in Europe. Meant to serve as a hub for local sneaker culture, art, music and sports, the Metro Detroit property features custom art from notable Detroit artist Désirée Kelly. The store is home to an activation space that will host regularly-scheduled events and activations for the sneaker-obsessed. In addition to community-oriented activations, the store will offer exclusive, city-centric products including adidas AM4DET – a new SPEEDFACTORY shoe designed by Kayla Donaldson, a Detroit native who took inspiration from her city, her craft and her story to bring the city and design to life. Other Detroit-inspired products include Nike’s “Home & Away” Collection, New Era hats, Herschel bags, Detroit vs. Everybody and District 81 apparel and more from local designers and personalities like Rick Williams. 1 PM – Foot Locker “Home Grown” activation unveiling Detroit-specific products and brands, featuring Icewear Vezzo and DJ BJ. 6 PM – “Women’s Culture Wednesday” with DJ Angel Baby, featuring a panel discussion with Désirée Kelly and founder of Femology Meagan Ward, and a sneaker planter workshop with Bodega Rose. 6 PM – adidas SPEEDFACTORY event featuring Detroit-inspired adidas AM4DET designed at PENSOLE Footwear Design Academy by local College for Creative Studies student Kayla Donaldson. 5 PM – Detroit native and rapper Big Sean will appear for a public Q&A about the science of music. Foot Locker will host a community giveback with PUMA and the Sean Anderson Foundation to offer sneakers, winter coats and backpacks to local kids from the Boys & Girls Clubs of Southeastern Michigan. 10 AM – Kids Foot Locker “Home Grown” activation. 5 PM – Detroit Got Talent Show hosted by Haha Davis with a performance by Tee Grizzley.